As soon as you arrive in Cochin, our representative will pick you from the airport or railway station with our cab services of Alleppey Houseboat Packages. The drive from Cochin to Alleppey is of not more than 2 hours and is complemented by the scenic beauty of the route. On your arrival you will be checked into Alleppey Beach Resorts. Relax yourself a bit after check in and then gear up yourself to have fun at Alappuzha Beach, Vembanad Lake, Pallippuram, Kuttanad, Pathiramanal and Marari Beach. Enjoy your overnight stay at Resort with bonfire, music and delicious food. Have your breakfast and then we will move forward to explore other places like Krishnapuram Palace, Arthunkal Church, Amabalapuzha Temple, Pandavan Rock and Kumarakom Bird Sanctuary. By afternoon, you will be checked into Boat house where you will be getting all the amenities from lunch to breakfast along with the scenic beauty of backwaters and islands. Stay overnight at the Alleppey House Boat. After having breakfast at Alleppey House Boat we will head towards Cochin to discover various places which are on the bucket list of our Cochin sightseeing package. You will be at Cochin within the two hours of drive. After that as per your schedule you explore plenty of alluring places like Fort Kochi, Mattencherry Palace, Bolghatty Palace, Vypeen Islands, Malayattor, Cherai Beach, Vypeen Beach, Andhakaranazhi Beach, Marine Drive, Hill Palace Museum, Veeranpuzha Beach, Folklore Museum, St. Francis Church, Santa Cruz Basilica and Shiva Temple. After the sightseeing of Cochin, our Cochin Alleppey tour package services will drop you at the required destination whether it is airport, railway station or bus stand. Are you also wondering where to spend your next weekend? Do you also have a thrill for nature? packages will grant you a dream weekend trip. Does the idea of beaches and boat house fascinate you? 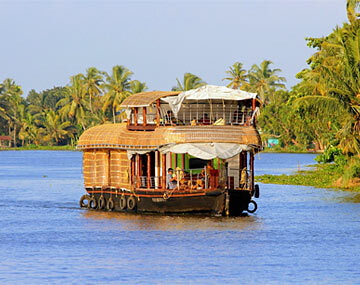 If yes, then, our Alleppey House Boat packages will grant you a dream weekend trip. Our holiday packages will take you to the Venice of East as well as the sight seeing for Cochin. We believe in creating dream vacation packages for our clients. Our Cochin Alleppey package takes you to the refreshing backwaters and exotic beaches of Alleppey and provides a tour of the magnificent places of Cochin. Kerala, fabulous place to have a nice honeymoon. Don't know how those three days went so fast. The houseboat cruise was awesome, I loved it pretty much. Had our honeymoon in the best way. Thanks bookotrip for your all arrangements.